In 1689, Vauban planned the opening of a new gate, in-between the castle and the Grand’Porte gate, in order to facilitate access to the town from the Sillon isthmus. He proposed extending the town wall to the sea and filling in the cove called the “Anse du Fief”, which formed the most sheltered part of the old tidal harbour. The project took twenty years to reach fruition. The engineer Siméon de Garengeau (Paris 1647 - Saint-Malo 1741) provided the plans required for what became the first expansion of the town. The new gate was opened in 1709. 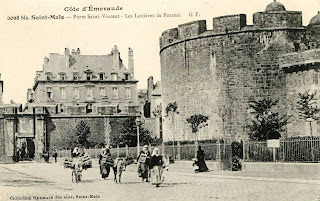 It was connected to the existing wall by a large town wall featuring thirty-two magazines with arched quarters on top that were “bomb-proof”, and featuring twenty-two gun ports. Traders who made their fortunes from importing silver from Peru, purchased sites in the extension and built impressive houses there. In 1890, a second archway was added to the left of the previous one. The gate featured wooden carvings of the coats of arms of Brittany above it (on the right-hand side) with the motto Potius quam mori quam foedari: (“Better dead than to be sullied”) and of the town of Saint-Malo (on the left-hand side) with the motto “Semper fideli” (“Always faithful”). Moreover, a plaque on the steps leading up to the ramparts is still visible. It cites the Latin text of an old inscription affixed above the gate in the 18th century that commemorated its construction.